I have discussed before how I'm not really a fan of the newer female rappers such as Nicki Minaj and Cardi B who act as if they are trailblazers when really they are basically doing what folk like Lil' Kim and others did first. I mean, I even said how, "Bodak Yellow," was one of the worst songs I had heard in quite awhile. Therefore, you can color me surprised that a song with Cardi B (as well as Bad Bunny and J Balvin) was one I actually found kind of catchy and...good? 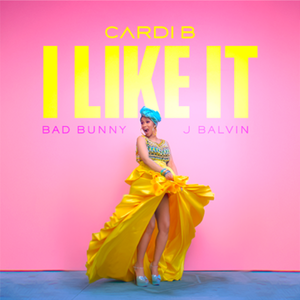 The song is, "I Like It," and features Cardi B doing her usual boastful raps, but she actually has some solid verses in this song, seems to adapt her flow to fit the song's pace, and as the tune is her with other artists she doesn't wear out her welcome. In another interesting twist, a chunk of the song is in Spanish with Bad Bunny speaking both it as well as English, and J Blavin rapping exclusively in Spanish. That delightful international flair mixed with the energetic horns and booming bass make a song that immediately catches your ear and makes you tap your foot along. I'm a surprised as anyone that Cardi B is on a track I quite enjoyed, but let's just enjoy this nice turn of events.